The Windstar conference was really interesting. Jim didn’t present but we attended a lot of interesting discussions/workshops together. Hunter and Amory Lovins of the Rocky Mountain Institute talked about the problems of fossil fuels, solar energy and, in particular, new light bulbs that could save a lot of energy. We’re all aware of these things now, but it was very leading-edge then. The brilliant Willis Harman from San Francisco’s Noetics Institute spoke about a lot of philosophical ideas, including how people create their own reality. Ted Turner was there, and he was also fascinating as a presence and as a communicator. 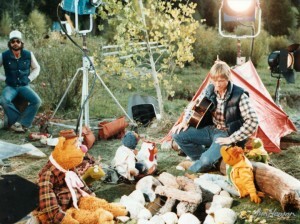 I think John Denver sang a few songs, but Jim did not perform. It was a packed two or three days with more speakers and panels than I can remember over a broad range of topics under the overall theme of the conference. In any case, it was a very stimulating experience for all of us and very much in keeping with all of the values we shared about what the world might be, how we could affect things, etc. It wasn’t so much “prescriptive” although there was a bit of that. It was more inspiring, a community of people from all sorts of different professions thinking about the future in positive ways. It was very much of its time, very little of the cynicism or the polarization that exists so prevalently now when people want to discuss these kinds of ideas. It was people just embracing and expressing new ideas and a sense of the positive possibilities of the world. There was, as in Fraggle, an implicit sense of global consciousness – we’re all in this together and need to help make a world for all – not globalization, which is almost the opposite idea that’s taken hold. We all had a common pursuit of the Big Questions – how does the universe work? What’s our place in it? What should we be doing at any given moment in our lives? The conference was part of our shared search for meaning. You can see this, really, in all of Jim’s work – maybe more obviously in Time Piece or The Dark Crystal – but Fraggle Rock and The Muppet Show really did embrace some of those ideas a lot of the time, usually expressed in comedy. It was the humor, the goofiness that, to my mind, made those ideas all the more true because so much of it is absurd and goofy, by nature – all part of being human. It was also very much a part of those times, although the questions continue in different ways today. 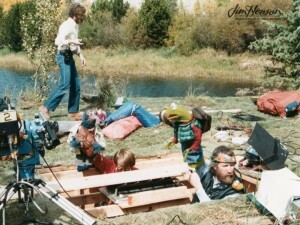 Jim and Kermit (and Dave Goelz and Gonzo) shooting the John Denver and The Muppets: A Rocky Mountain Holiday television special in Colorado, 1982. John Denver and the Muppet gang in Colorado shooting A Rocky Mountain Holiday television special, 1982. This entry was posted in 06-June '86, 1986 and tagged Aspen, Fraggle Rock, Jocelyn Stevenson, Larry Mirkin, The Dark Crystal, The Muppet Show, Time Piece, Windstar Foundation. Bookmark the permalink.